tallgrass prairie studio: It's a Gem! I'm starting the week introducing the second sponsor of my blog. It's another local gal and this time it's not only an online store, but brick and mortar as well. bon bon atelier is a Kansas City gem. 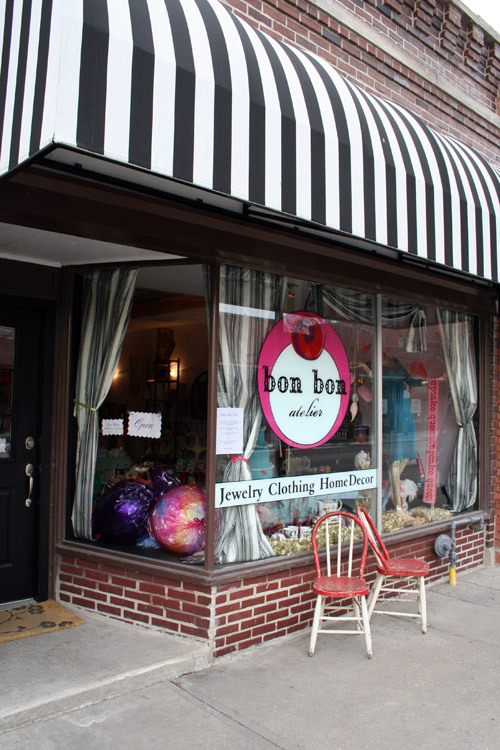 Run by sisters Betsy and Emily, bon bon has evolved from a shop that showcased handmade items, into a store to support artists who are the makers. These gals have exquisite taste and are the definition of good things come in small packages. Betsy and Emily's goal for their store is not only to showcase the handmade, but to bring artistic and handcrafted fulfillment to folks in a fast-paced technology driven world. (Kinda sounds like me, doesn't it?) Stepping into bon bon is like slowing the world for me. 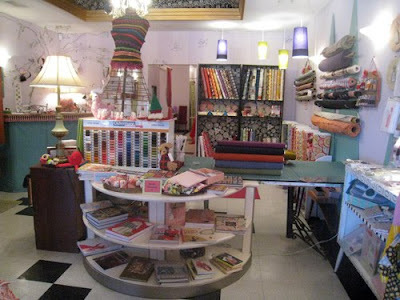 The store invites browsing, fondling of fabric, perusing books and is always an inspirational experience. If you're anywhere near Kansas City, it's a must stop. I do my Christmas shopping at bon bon. It's never too early to start, you know! Bonbon is also unique in that you will never see these gals carry an entire fabric line. They only buy what they love (fabric buying is a deeply personal experience for them!) and they work with their customers to put together one of a kind fabric combinations. I love a place where I can find what no one else seems to have. It's always a treat to see what Betsy and Emily have on the shelf. And Liberty....ohh the Liberty. If you've never seen or touched Liberty of London fabrics, it's an experience you need to have. I buy Liberty for very special projects. It's a joy to work with and simply gorgeous. I made scarves for some very special friends with Liberty this Christmas. Betsy and Emily want all their customers to have the bonbon experience. They strive to do that both in person and online. Check out bonbon. 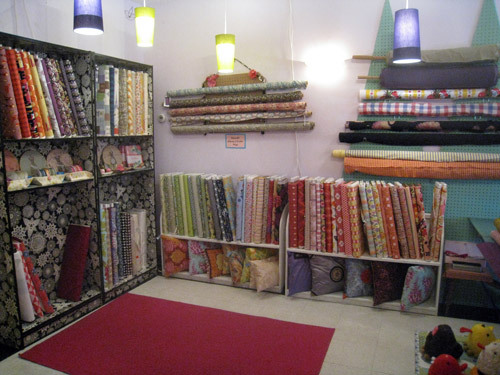 It's not your average fabric store. They've got free patterns too. Betsy and Emily are offering a coupon for my readers, 10% off online with the promo code tallgrassprairie. 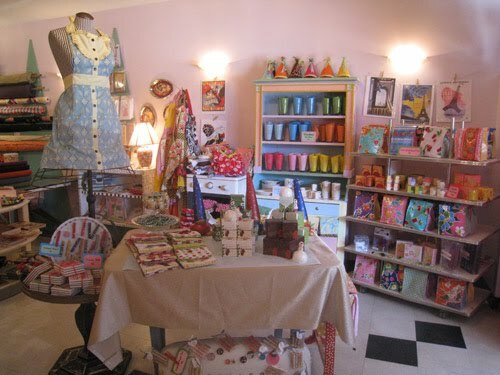 Put bon bon on your list of places to visit when you come to quilt market in the spring of 2012. It's going to be in Kansas City, you know! We have the welcome mat out for you!! Bon Bon looks amazing! It's so hard to find what I call Experience-Shops here in Portugal, you know, when visiting a shop is an experience all on its own just from what it makes you feel and how the creative juices start running just by being there? Congrats! Oh my! I have added it my list for my next KC trip. Since my daughter and family are there we make it to KC at least once a year. What a cute store! Thanks for sharing Jacquie. Oh, please fix the typo in the second paragraph! I'm a Betsy and hate it when my name isn't even spelled right phonetically. done! thanks for your keen eye! That does look like a super fun shop to hang out and spend some time (and money!). Oh cool...I didn't know! As fast as time flies, 2012's Market is right around the corner. I LOVED the KC venue the last time (and first, actually) I was there! I love the pics and story you've shared, Jacquie. What a quaint store...sounds like it's full of character!